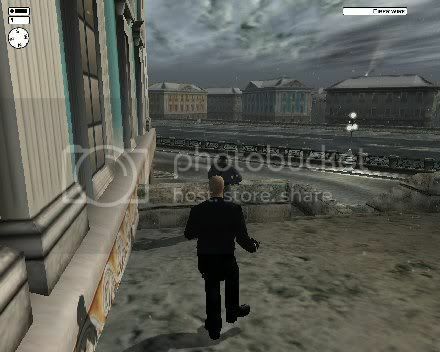 by PaulEMoz in "Agent 47", "Blood Money", "Eidos", "Hitman", "Silent Assassin", "stealth"
I'll be honest with you, Hitman was not a game that was on my radar when it was first released. The word "stealth" was tied heavily to it, and that's not usually a gaming trait that sits well with me. But my missus, believe it or not, quite fancied it, and so it was bought and installed on our PC. And whaddya know, I quite enjoyed it! Hmmm. Could have done without seeing that. I always found it a bit odd that you play a top-class stealthy assassin... with a big barcode tattooed on the back of his head. Surely that's just drawing attention to yourself? Grow some hair. Wear a hat. Wear a scarf. Anything that doesn't make you look so distinct... it's not exactly a common design, is it? I bet Sam Fisher hasn't got a barcode tattoo. Anyway, the object of this game (and in fact, the series of games) is to take out a number of specified targets across the globe. It's alright, they're all evil... you're doing the world a favour, so you can sleep with a clear conscience. This is a really interesting aspect to the game, one that I found refreshingly different from the usual "hide in the shadows" guff. Couple this with what I thought was a genuinely interesting storyline, and it's easy to see why Hitman was, erm, a hit. In a quiet moment, Agent 47 plays at being David Beckham. There are new Hitman games on the way, but what better way to tide yourself over than with three, yes, THREE Hitman games for the PC? I'm giving away The Hitman Collection on Steam for one lucky reader. 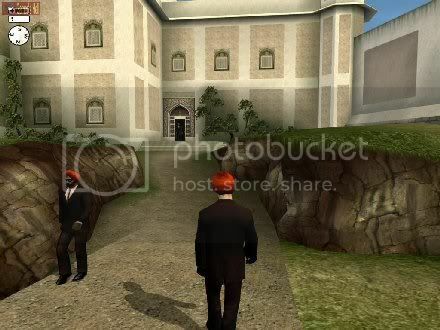 This includes Hitman: Codename 47, Hitman 2: Silent Assassin and Hitman: Blood Money. Not bad, for nothing! All you have to do is plug this blog somewhere appropriate (Twitter, your favourite gaming forum etc. ), and then make a post here telling me where you spammed me, and you're in the draw! Good luck!